The third sunday of May every year, at the Asakusa Shrine (浅草神社 “Asakusa Jinja”), you can experience one of the three biggest Shinto festivals in Tokyo. This weekend, with it’s peak on Saturday May 17th, it is time again for “Sanja Matsuri” (三社祭, lit. 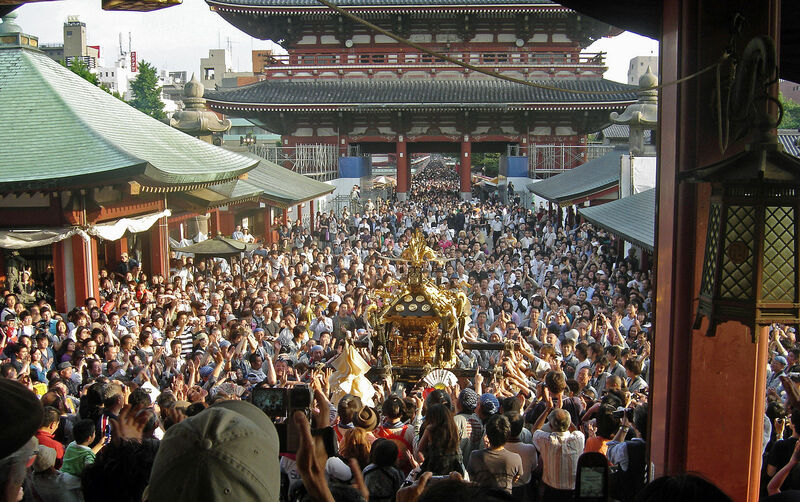 “Three Shrines Festival”), an event that is considered the largest and wildest festival! The festival is held in in honor of the three men that founded the Sensou-ji (浅草寺 “Sensou-ji”), and big parades are held, where three portable shrines, which are referenced in the name of the festival, are the centre of attention, but there are also traditional music and dancing, and over the three days it’s held it attracts millions, tourists and locals alike. On friday at 1 pm, there is a big parade, and later in the afternoon there will be traditional dancing in the “Haiden” and the “Kaguraden” buildings in the temple grounds. On Saturday at 12:30 pm there is a large parade with hundreds of local portable shrines, that tour around the town of Asakusa. On Sunday at 6 am the three main portable shrines start their tour of the local area, and are returned around 8 pm. If you want to experience Japanese culture, see traditional dancing, listen to traditional music, and maybe get a glimpse of a “yakuza” or two showing of their tattoos, as well as experiencing the biggest festival in Tokyo, this is definitely the event for you.